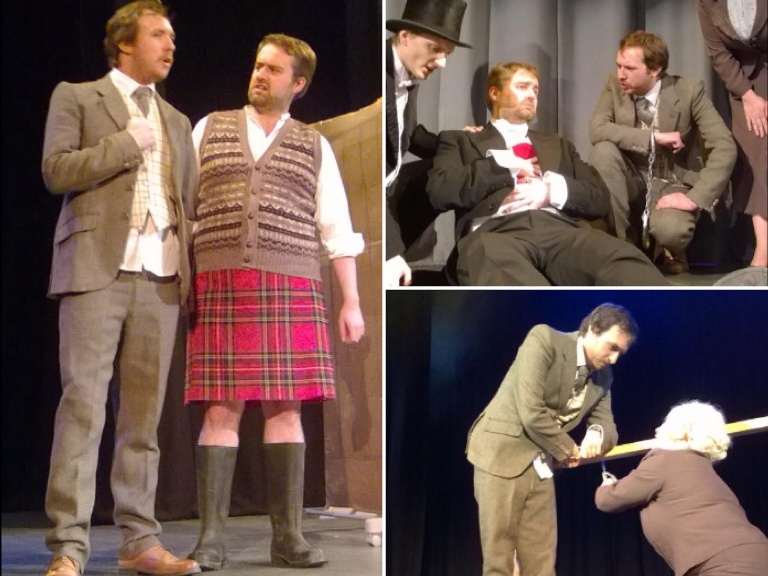 Murder, mystery, British gung-ho and plenty of laughs! Take Hitchcock’s classic spy thriller, throw in some stiff upper lip and British gung -ho, a femme fatale, a handsome hero, spies, chases, murder and a rather fetching pencil moustache and you’ve got the recipe for the latest offering from The Ulverston Outsiders. Having seen this played out in a rehearsal earlier in the month I had high hopes for this production and as I took to my seat (E7…just in case you’re curious) I couldn’t wait to see how it looked on the big stage. Well, it’s fair to say that The Ulverston Outsiders made a triumphant return to The Coronation Hall last night as they brought the excitement, and laughs, to a very busy opening night. Hannay decides on a trip to the theatre. Whilst watching a performance by Mr Memory (Paul Jordin), shots are fired and Hannay finds himself back at his flat with the mysterious femme fatale Annabella Schmidt (Hanna Fishwick) who mysteriously ends up with a knife between the shoulder blades. So begins a thrilling chase involving spies, a train a plane (possibly my favourite part of the play) the Forth Bridge, false identities, the London Palladium, the mysterious 39 steps and plenty of laugh out loud moments courtesy of the fabulous Outsiders cast. Under the direction of Tony Smith, The Outsiders transport the audience from London flat to Scottish mansion, from music hall to moorland with some creative and downright hilarious props and set design giving the audience plenty to enjoy. A special mention has to go to Rob O’Hara and Adam Atkinson who were terrific, juggling their many roles expertly, the train carriage scene in particular was as impressive as it was funny. But the whole cast (15 in total) all played their part in making this a truly fantastic production. If there were any first night nerves – they certainly didn’t show, and I didn’t spot any mistakes – to be honest I was too engrossed to care even if there was. To my mind, the success of a production is all about how the audience feels, and judging by the smiles, laughs and applause at the end – The 39 Steps is an absolute triumph. The Ulverston Outsiders production of The 39 Steps runs till 23rd November at The Coronation Hall.